Now that the base cake was done and the difficult, if somewhat lacking, candy eye were completed, it was time to add the details and finish the cake. First, I needed to add a grill texture to the bottom of the cake to simulate Hal’s speaker grill. I put the frosted cake back in the freezer, saying another “thank you” to my wife for that tip, and let the frosting harden up a bit. Removing it from the freezer, I took my chef’s knife and make very shallow cuts in the frosting, horizontal and vertical, creating a passable speaker grid. Next, I shaped a piece of blue colored fondant for the name label at the top and put the candy eye in place. I used white cake gel to add the trim and write HAL 9000, as well as cover up the seam around Hal’s eye. I’ve decided I don’t like cake gel for these kinds of things. It was too gooey and didn’t give me great results. I had already resigned myself to getting whatever I got with this cake, though. The mission was finished. It’s degree of success had yet to be measured. I don’t know if the result was worth all the trouble or not. The cake impressed my wife and kids, even if it wasn’t exactly what I’d had in mind. I did learn a few things along the way. I keep telling myself, “Next time, I’ll know this and can try that,” but I’m not sure they’re be a next time. Not with Hal, anyway. Then next problem in the mission came from the cake, itself. Or, rather, from it’s covering. Black fondant would have given me a smoother finish, but I don’t like to completely cover cakes in fondant. I don’t like eating that much fondant in one sitting. I prefer butter cream frosting so, I settled on chocolate frosting and a brown Hal. I cut the cooled cake in half, placed one half on top the other, and glued them together with frosting. I next trimmed the sides to get the correct dimensions and a smoother edge. So far so good. The trouble was, the frosting wouldn’t stick. Or rather, it stuck too much. The crumb of the cake was so tender that whenever I tried to spread it over a trimmed side, it would tear the cake apart. It didn’t matter how much I whipped and mixed and soften the frosting, every stroke with the knife tore piece after piece of cake away from my beautiful rectangle. Unlike David Bowman, my shipmates weren’t dead. My wife knows that when she sees me sitting at the table with my head in my hands and swearing, it’s a pretty clear sign that something is wrong. Responding to my distress call, she came over, assessed the situation, and suggested I put the cake in the freezer for a little while. My wife has taken one more cake decorating classes than I have. That’s not hard to do, considering I’ve never taken any. The point is, she knows of what she speaks. She just doesn’t like the actual work involved in decorating cakes, so doesn’t do it very often She happy to let me be the glutton for punishment that I am. The freezer trick worked wonders. Unfortunately, I had to make a run to the store to pick up more supplies. I ran out of chocolate frosting 3/4’s of the way through. Things were looking up, though. I had the frosted cake, and a defective candy eye. The rest was just details. 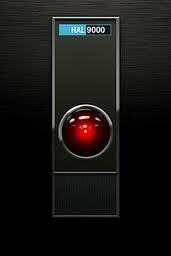 Making Hal 9000 – Part 3: Open the Pod Bay Doors, Hal. As you can see in the picture, the set up on the scoops isn’t very solid. I needed a way to make them as level as possible while the candy cooled and hardened, so I put them on top of two bowls. As I stuck the red eye into the candy goo from the second batch, the scoop tipped, pouring molten candy over my cupboard. Speaking in tongues, I worked as fast as I could to pour more candy in the scoop and move the red light piece back to the center without burning myself. This worked great until pushing things around upended the ice cream scoop, dumping more candy. The third time was not the charm. This time I tipped it over trying to clean up the candy that had spilled. It was like a little kid. Get something clean just in time for the kid to make another mess. Finally I got things settled, with the red light buried much deeper than I’d hoped. By that time I was tired of it, though. Sometimes projects aren’t finished so much as they are abandoned. I would live with whatever the result was, or trash the candy eye altogether. Hal would not get the best of me any more than he did David Bowmen. If that had been the only problem, I might not have lost my mind. Making Hal 9000 – Part 2: Would You Like to Play a Game of Chess? Read Part 1 of the Hal 9000 Cake Project. The tricky part was going to be Hal’s eye. I knew that, going in. The plan was to make a clear candy shell for the outside, and a red tinted shell for the glowing center. I hunted around town a bit and found two ice cream scoops that I thought would work for molds. Next, I found a couple of recipes for “stained-glass candy” and counted myself set. The first batch of candy worked pretty well. I poured the outer layer of Hal’s eye first, then tinted the candy red and poured the “red light” piece. Unfortunately, the candy didn’t behave as I had hoped. It had caramelized slightly, giving the clear candy a yellow-tan tint instead of being crystal clear. I also had trouble making it a shell. I couldn’t pour the inner candy out of the mold, and still have it stick enough to the sides, to make a shell. I was stuck with two solid pieces, each half of two different spheres. Like any good astronaut, I had a back-up plan, using only colored fondant to make a 2-D version of Hal’s eye. In the end I decided that wasn’t good enough. I would try again with another recipe that would give me better results. January 12th is the birthday of HAL 9000, the computer installed in the Discovery spaceship from 2001: a Space Odyssey. Why anyone but a die-hard science-fiction fan-boy would care is beyond me. Being a die-hard science-fiction fan-boy, I decided to celebrate Hal’s birthday by making a Hal cake and watching 2001 with my kids. They were happy to do it. They're suckers for chocolate cake. I was nervous going into the project, although I knew I could do the main body pretty easily. The iconic face of Hal is just a long rectangle, after all. It was the eye that bothered me. That glowing, red, menacing computer eye! I had three goals in mind. It had to be 3-dimensional, recognizable and above all, edible. I started by making a single-layer chocolate cake in a 13 inch by 9 inch cake pan. I bought a commercial cake mix, knowing I had quite a bit of work cut out for me with the decorating. This was going to have to take place over a couple of week nights, and I wouldn't have that much time in the evening. The cake was baked the first night, and then cut and shaped the next. I cut the full cake in half, setting one half on top of the other, and trimmed it to make the sides and top even. So far so good. The second night, I would make Hal’s eye. Little did I know, this part of the project might prove to be as doomed as the Discovery mission.